In 1849 in the rush to the goldfields of California the Bennett-Arcane party of the Mojave-San Joaquin wagon train decided to try an unknown shortcut and became stranded in what is now known as Death Valley. 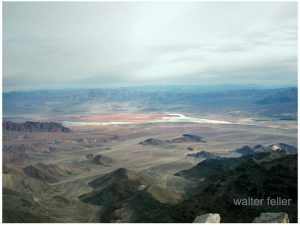 Two young men, William L. Manly and John Rogers walked out, across the desert and into the canyons north of Los Angeles. At a rancho in San Francisquito canyon they managed to get a white horse and a one-eyed mule as well as supplies then they walked back to those who were remaining at the camp. Once they returned they led the lost party to safety. Following are their observations of the topography of the Mojave and how Manly claimed Death Valley got its name. The range next east of us across the low valley was barren to look upon as a naked, single rock. There were peaks of various heights and colors, yellow, blue fiery red and nearly black. It looked as if it might sometime have been the center of a mammoth furnace. I believe this range is known as the Coffin’s Mountains. It would be difficult to find earth enough in the whole of it to cover a coffin. Just as we were ready to leave and return to camp we took off our hats, and then overlooking the scene of so much trial, suffering and death spoke the thought uppermost saying:–“_Good bye Death Valley!”_ then faced away and made our steps toward camp. Even after this in speaking of this long and narrow valley over which we had crossed into its nearly central part, and on the edge of which the lone camp was made, for so many days, it was called Death Valley.